Thomas and Richard Rowney began manufacturing artist's colors in England more than 200 years ago. Daler-Rowney's Georgian Oils have been the UK's best-selling oil colors for decades, and now they've gained a reputation around the world. Now more than half the output from the company's color factory in Bracknell, England, goes overseas. This high quality line of color is produced at a uniform and economical price. Daler-Rowney Georgian Oil Colors are ideal for use with a knife or a brush, allowing for a variety of effects to be achieved. Every batch is matched for color and texture against exacting standards to ensure they will perform perfectly anywhere in the world, from the Amazon to Antarctica. Daler-Rowney's Georgian Oils are made in the same way as Rowney's Artist Oils, to the same high standards. The main difference between them lies in the choice and strength of pigments. Starter Set — This set contains six 22 ml tubes of Georgian Oil Color, including Titanium White, Cadmium Yellow, Cadmium Red, Ultramarine, Viridian, and Burnt Umber. Rowney Georgian Oils include some organic alternatives to the more costly metallic pigments, indicated by the term "hue" in the color name. Pigments used in the hues are chosen carefully to provide a high degree of permanence and to match the hues of the more costly metallic pigments. 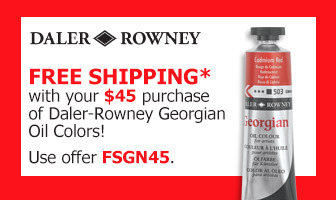 Daler-Rowney's Georgian Oils offer excellent quality at a uniform price across the color range, giving the opportunity to learn and experiment. Monestial Colors — Monestial Green, Monestial Turquoise, and Monestial Blue contain phthalocyanine pigments, and are equivalent to Phthalo Green, Phthalo Turquoise, and Phthalo Blue in other color lines. Hues — Cadmium Yellow Pale, Cadmium Yellow Deep, Cadmium Orange, Cadmium Red, Cadmium Red Deep, Carmine, Chrome Lemon, Chrome Yellow, Chrome Orange, Chrome Green, Cobalt Blue, Cobalt Violet, Coeruleum Blue, Emerald Green, Terre Verte, Vandyke Brown, and Viridian are hues, with a blend of organic pigments carefully selected to match the color and texture of the equivalent natural and metallic colors. Whites — Titanium White is the most opaque and whitest of oil color whites, and is inert to other pigments. Zinc White is the most transparent white, as well as the slowest drying, and is widely used for tinting and glazing. Flake White, the fastest drying and most flexible of the whites, is widely used in underpainting. Georgian is a high quality oil paint at an economical price. The lightfast, permanent pigments are finely milled for easy blending. Georgian is carefully tested for consistancy and there is no color shift between wet and dry paint making color matching a breeze!